The Kings Head017687 73331work01768775926fax InnA former 17thC coaching inn situated at the foot of Helvellyn in the heart of the Lake District, The Kings Head is surrounded by spectacular scenery with unsurpassed views toward St Johns in the Vale, Blencathra and Skiddaw. Full of old world charm and character with oak beams and inglenooks, roaring log fires in winter, comfortable bedrooms, real ale and award winning food served in two individual restaurants. The Kings Head offers a traditional base from which to explore this beautiful region. Special Christmas and New Year Packages available. The Kings Head also caters for weddings. The Kings Head sometimes limits bookings to 2 or more days. Delightful double with sweeping views down the valley towads St. Johns in the Vale, Blencathra and Skiddaw. Beautifully decorated en suite double with four poster bed and Victorian bathroom, ideal for romantic breaks. Four Poster sometimes limits bookings to 2 or more days. 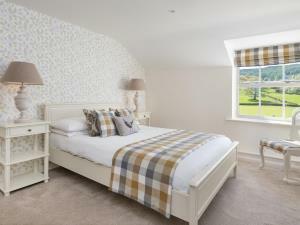 Twin bedded room with en-suite facilities and views of the surrounding fells. Twin sometimes limits bookings to 2 or more days. 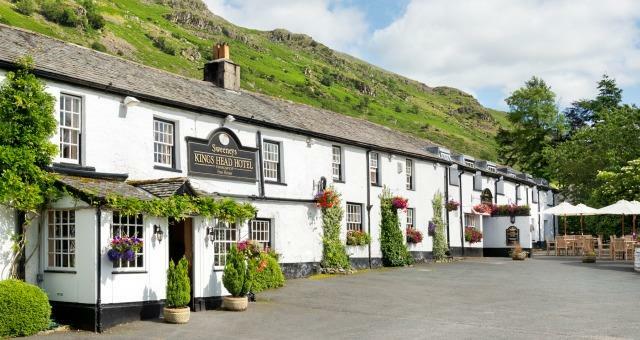 A former 17thC coaching inn situated at the foot of Helvellyn in the heart of the Lake District, The Kings Head is surrounded by spectacular scenery with unsurpassed views toward St Johns in the Vale, Blencathra and Skiddaw. Full of old world charm and character with oak beams and inglenooks, roaring log fires in winter, comfortable bedrooms, real ale and award winning food served in two individual restaurants. The Kings Head offers a traditional base from which to explore this beautiful region.